Friends can join me in the Chinese New Year Parade!!! am bringing it to walk with the “Dr. Sun Yat Sen Gardens” group. This entry was posted in Main Page on January 29, 2012 by Todd. 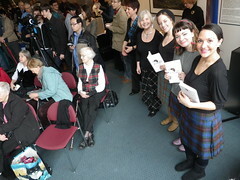 Pictures from the Robbie Burns Day, marathon of poetry reading… lots of great fun. Dr. Leith Davis – creator of the Marathon Poetry reading event at SFU Harbour Centre. She is director of the Centre for Scottish Studies, SFU. We pose by a small bronze replica of the Robbie Burns Statue in Stanley Park, created for the St. Andrews & Caledonian Society of Vancouver. 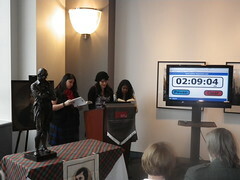 three of Leith's students give a reading – look at the time clock! 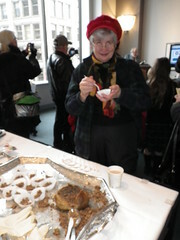 Storyteller Mary Gavan read some poetry, then enjoyed the haggis I served her. My friends Bruce and Bob also gave poetry readings. 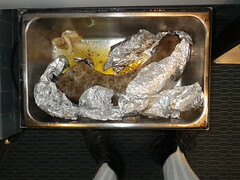 I have never seen a BIGGER HAGGIS. This entry was posted in Main Page on January 26, 2012 by Todd. Black Bear Rebels who performed that evening. This entry was posted in 2012 Gung Haggis Fat Choy Dinner, Gung Haggis Fat Choy dinner, Main Page on January 23, 2012 by Todd. but hey – it's the 15th anniversary dinner. The introductions were less rushed… and very good. It was great to segue from O Canada, to a parliamentary poet…. 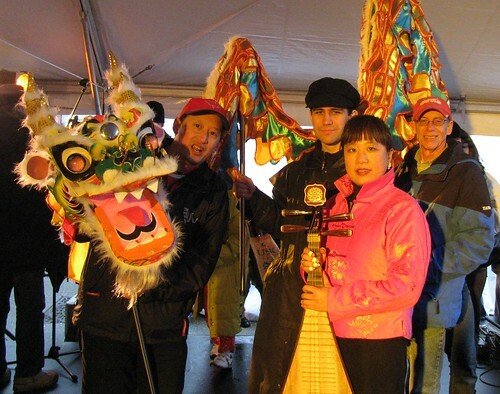 from counting down Chinese New year in a different time zone – to celebratory music. And the production would never have happened without volunteer and supporters…. and investing your time and energy. to all my friends across the Country…. Especially Halya Kuchmij, who directed the CBC documentary Generations: The Chan Legacy – about our family's 5+ generation contributions to Canada, and who is going to call us onstage at tonight's Gung Haggis Fat Choy Dinner, as we celebrate Year of the Dragon arriving in Toronto! And also especially to writer Susan Crean who was our recent writer in residence at Historic Joy Kogawa House and helped encourage me to come to Toronto for a Gung Haggis Fat Choy Dinner… as Deb & I chatted with Susan on her last night in Vancouver after her residency, when we took her for dinner at Wild Rice restaurant at the edge of Vancouver Chinatown. And to all our friends and family in Victoria, Calgary, Toronto, Montreal, Sasketchewan (like my cousin Janice Wong's mother), and even in the USA in Portland and Seattle, San Francisco, San Jose, Los angeles and New York City… and over in Hong Kong… and Scotland, where I had such a great time in Edinburgh for Homecoming Year 2009. This entry was posted in Main Page on January 22, 2012 by Todd. 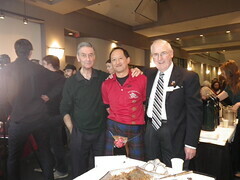 The Firehall Box Office is now closed for the Gung Haggis Fat Choy Robbie Burns Chinese New Year Dinner event. Thank you for purchasing your tickets in advance. Our Box Office closes at 2pm Saturday, to help us facilitate seating arrangements for the event. Priority seating is given in order of ticket purchase. The earlier you purchased your ticket, the closer to the stage, your seats will be – then somebody who purchased tickets on the last day of sale. Tomorrow night is going to be fun – see you there! This entry was posted in 2012 Gung Haggis Fat Choy Dinner, Gung Haggis Fat Choy dinner, Main Page on January 21, 2012 by Todd.